Almighty God, I call for a mighty blue sphere of protective energy around my heart. I call for the maximum protection of Archangel Michael and the guardian angels. I call for the intensification now of the sealing of the heart in blue fire, in the grid of light that is the original blueprint for my heart—my physical heart, my heart chakra, the secret chamber and the threefold flame. Beloved Mighty I AM Presence, beloved Holy Christ Self, beloved Jesus, now intensify the original divine image of my Christhood within my mighty threefold flame. I call to you, beloved Archangel Michael, for the protection of the vessels of the heart in the many levels of being as I prepare to receive a greater light and balance. And I call for the protection of all who are devotees of the Light from all that hinders or would hinder the intensification of the threefold flame in their heart. Whenever you give this decree, visualize Archangel Michael as a beautiful, powerful archangel. See him with his legions of Light accompanying you and sealing you and your loved ones in an invincible wall of blue-flame protection—ring upon ring of intense sapphire blue energy. Visualize Archangel Michael as a majestic angel, arrayed in shining armor and wearing a cape of brilliant sapphire blue (the color of protection). See him placing his magnificent presence around you, your family, your friends and all those for whom you are praying. Give this decree to Archangel Michael with Elizabeth Clare Prophet. And now cut me free! And in full Faith I consciously accept this manifest, mani-fest, manifest! (3x) right here and now with full Power, eternally sustained, all-powerfully active, ever expanding, and world enfolding until all are wholly ascended in the Light and free! Affirmations are effective steps to invoking spiritual protection from Archangel Michael and your guardian angels. Wrap yourself and your loved ones in swaddling garments of light! Step 1: Surround yourself with a protecting column white light. This tube of light is a shield of protective white light, about nine feet in diameter. It streams down from the I AM THAT I AM above you and extends beneath your feet. It can guard against energies of malice that may be directed at you — through anger, condemnation, hatred, jealousy. When you are unprotected, these vibrations can make you irritable or depressed. By calling more violet light into your world, you also attract the negative energy that seeks resolution in the flame. So you simply put on the “armor of the Lord” – your spiritual armor of blue fire prior to expanding your forcefield with world-changing violet flame. 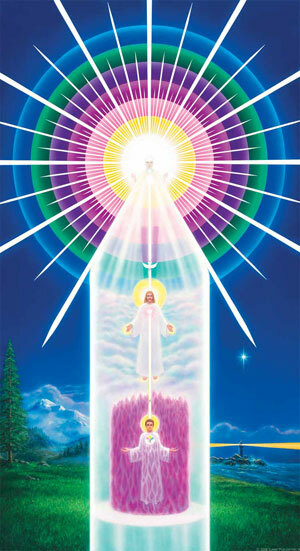 The white light can also protect you from the pull of the mass consciousness. When you feel exhausted after a trip shopping, it's often because your energy was drained. The tube of light helps you seal your aura, stay centered and meet all tests of patience and goodwill in peace. Why not give this decree each morning before the hustle and bustle of the day begins or for those moments when you really feel out of sorts? See the dazzling white light from your I AM Presence, brighter than the sun shining on new-fallen snow, coalescing to form an impenetrable wall of light around you. Inside this scintillating tube of light, see yourself enfolded in the violet flame. Throughout the day, reinforce this spiritual protection by visualizing the tube of light around you and repeating the decree. 2. Seal your heart and your aura with the white and blue protective energy. This sets a energetically sealed forcefield for your violet flame decrees. Whenever you give this decree to Archangel Michael, visualize him as a beautiful, powerful archangel. See him with his legions of Light accompanying you and sealing you and your loved ones. Feel that invincible wall of blue-flame protection — ring upon ring of intense sapphire blue energy that centers on a blue sphere of protective energy around your heart. Visualize Michael's magnificent bejeweled sword of blue flame cutting around you, flashing blue flame into the cause and core of all negative energy that who seek to invade your aura, affect your family or your household to with any inner or outer torment. See this beautiful, powerful, majestic Archangel standing before, behind, to the left, to the right, beneath, above, and in the center of your form accompanied by limitless numbers of comforting angels of the First Ray protecting you, escorting you wherever you go. Give this decree with joy and gusto and know that when you call to Archangel Michael and his legions of angels, they will immediately be at your side. You can also give a fiat (a short, powerful exclamation) to call forth God's light. Giving a fiat with fervor and love quickly invokes the assistance of the heavenly hosts. Use the following fiat to call for the instantaneous protection of Archangel Michael. Archangel Michael, Help me! Help me! Help me!